Daniel Hernandez (born May 8, 1996) professionally known as 6ix9ine or Tekashi69, is a Mexican-American rapper who is based in Brooklyn. Hernandez is known for his distinctive rainbow-themed look, tattoos, aggressive style of rapping, public feuds with fellow celebrities, legal issues, and controversial public persona. Hernandez rose to mainstream fame in late 2017 with the release of his debut single "Gummo", which was certified platinum by the RIAA. In early 2018, Hernandez released his debut mixtape, Day69, which debuted at number 4 on the Billboard 200 album chart. He later earned his first top-five entry on the Billboard Hot 100 with "Fefe", featuring Nicki Minaj and Murda Beatz, which peaked at number three on the chart. His debut studio album, Dummy Boy, was released on November 27, 2018, after being delayed a week earlier due to his arrest, and debuted at number two on the Billboard 200 chart. Hernandez pled guilty to using a 13-year-old child in a sexual performance in 2015. He was arrested in November 2018 on racketeering and firearm charges, among others, for which he is facing a possible life sentence in federal prison. Early Life He was raised with his older brother by his parents until he was 13, when his father was shot dead steps away from the family home. Emotionally disturbed by the death of his father, Hernandez started to act out and was eventually expelled from school in the 8th grade for bad behavior. Rather than continue his education, he started working various odd jobs such as working as a busboy to help his mother financially. Hernandez also dealt drugs to supplement his income, most notably selling cannabis and heroin on the streets while working at a local Brooklyn bodega. He was eventually arrested for his criminal activities and sentenced to prison time at Rikers Island, where he began to associate himself with the Nine Trey Gangsters, a prison subset of the Bloods street gang. Hernandez began his career as a rapper in 2014, releasing songs such as "69" and "Scumlife". Other early songs were taken down by YouTube. Career Hernandez began releasing rap songs in 2014. Over the next three years, he released multiple tracks and videos with titles such as "Scumlife", "Yokai", and "Hellsing Station", drawing attention for his aggressive rapping style and use of anime as music video visuals. Many of his early songs were released by FCK THEM, a music label based in Slovakia. 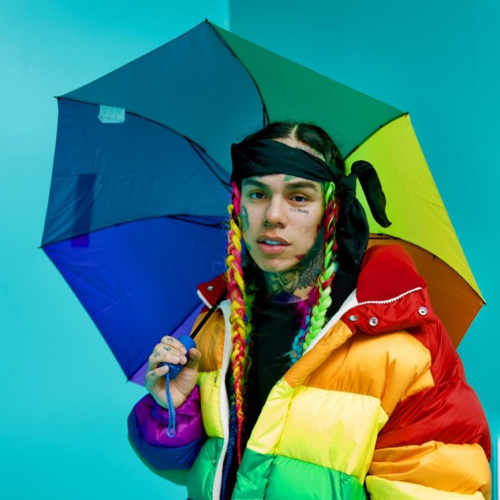 Gathering fame as an internet meme for his rainbow-dyed hair and rainbow-plated grills, he eventually became an associate of fellow New York rapper ZillaKami. They later feuded after Hernandez allegedly stole instrumentals and songs they had made together. Hernandez's commercial debut single "Gummo" was released on November 10, 2017, and eventually peaked at number 12 on the US Billboard Hot 100. It was certified platinum by the RIAA on March 5, 2018. His next single, "Kooda", debuted at number 61 on the Hot 100 the week of December 23, 2017. On January 14, 2018, Hernandez released his third single, "Keke", with Fetty Wap and A Boogie wit da Hoodie, which also charted on the Hot 100. Shortly afterward, Hernandez announced his debut mixtape, titled Day69. The mixtape was released on February 23, 2018, and debuted at number 4 on the Billboard 200 album chart with 55,000 album-equivalent units, of which 20,000 were pure sales. According to Jon Caramanica of The New York Times, the tape was an outgrowth of the "SoundCloud rap explosion", and was notable for its willingness to deviate from hip-hop's prevailing sound. After the release of Day69, two songs from the album, "Billy" and "Rondo" both debuted on the Billboard Hot 100, with "Billy" peaking at number 50 and "Rondo" at number 73. In April 2018, Hernandez released "Gotti", a remix of a feature he did for artist Packman titled "Got it, Got it". The song's video was released on April 16, 2018, and involved footage of Hernandez donating bundles of $100 bills to poor citizens in the Dominican Republic. The song was added to Day69 as a deluxe song and debuted at number 99 on the Billboard Hot 100 before dropping off the following week, making it his sixth consecutive Hot 100 entry. Hernandez stirred up controversy in May 2018 when he was involved in a shooting with the entourage of fellow New York rapper Casanova as part of a feud; this led to Hernandez losing a $5 million headphone deal and being banned from the Barclays Center. After the shooting, Hernandez stopped releasing music for several months, before releasing "Tati", featuring DJ Spinking in June, which debuted at number 43 on the Billboard Hot 100. In July 2018, Hernandez released his eighth single, "Fefe", featuring Nicki Minaj and Murda Beatz; the single debuted at number four on the Billboard Hot 100 before peaking at number three in its second week, marking 6ix9ine's highest entry on the chart and his first single to reach the top five of the Hot 100. "Fefe" was later certified double platinum by the Recording Industry Association of America. His subsequent singles, "Bebe" and "Stoopid", also reached the top 30 of the Hot 100. In early October 2018, Hernandez was featured on the song "Aulos Reloaded" with French house DJ Vladimir Cauchemar and "Kick" with Danish singer Jimilian. On November 7, 2018, it was announced that his debut studio album, Dummy Boy, was to be released on November 23, but on November 21, it was announced that the album would be postponed. The album was ultimately released without notice on November 27, on all streaming services.